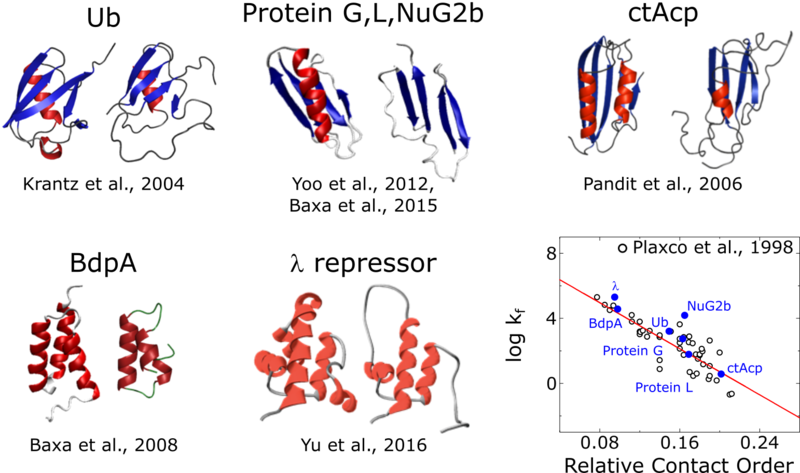 We are interested in characterizing the general principles that govern protein folding. 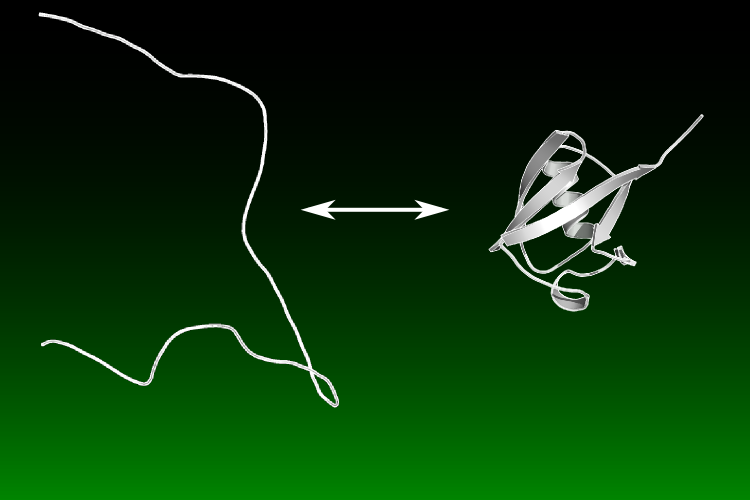 Despite being a long studied problem, many questions remain unresolved, for example the physical folding events that dictate the pathway as well as a concise understanding of the origins of the cooperative protein folding. Our studies are consistent with the principle of Sequential Stabilization - that protein folding is a series of smaller folding events described by the concurrent formation of secondary and tertiary structure, e.g. a turn of helix forms which buries hydrophobic surface area. This incremental accumulation of structure mostly produces native- or unfolded-like regions during folding, as suggested by the frequent observation of ψ values of 0 or 1 as well as the cooperative pattern of protection factors for hydrogen exchange (HX). We have characterized the transition state ensembles of several proteins and have found a common feature – that is the transition state achieves 70-80% of the native topology (as defined by relative contact order - Plaxco et al., 1998). This "70% Rule" supports the belief that topology is a critical feature of the transition state and supports the correlation between folding rate and topology. Furthermore, the high threshold places a strong constraint on feasible transition state structures for a particular native topology. What makes a protein cooperative? Our current views on the origin of folding cooperativity and stability are challenged by our studies of snowflea anti-freeze protein (sfAFP), which has a unique fold composed of 6 polyproline 2 (PP2) helices arranged in a 3x2 stack held together by inter-helical H-bonds. Despite lacking a hydrophobic core and being 46% Glycine, sfAFP is stable and folds in a two-state manner. sfAFP highlights that while we have a good, at least qualitative understanding of folding for typical, relatively small systems, much remains to be determined, especially the proper balance of the various forces that drive folding. Z.P. Gates*, M.C. Baxa*, W. Yu, J.A. Riback, H. Li, B. Roux, S.B.H. Kent, T.R. Sosnick, "Perplexing cooperative folding and stability of a low-sequence complexity, polyproline 2 protein lacking a hydrophobic core" Proc Natl Acad Sci U S A 114 (2017) 2241-6. W. Yu, M.C. Baxa, I. Gagnon, K.F. Freed, T.R. Sosnick, "Cooperative folding near the downhill limit determined with amino acid resolution by hydrogen exchange" Proc Natl Acad Sci U S A 113 (2016) 4747-52. M.C. Baxa, W. Yu, A.N. Adhikari, L. Ge, Z. Xia, R. Zhou, K.F. Freed, T.R. Sosnick, "Even with nonnative interactions, the updated folding transition states of the homologs Proteins G & L are extensive and similar" Proc Natl Acad Sci U S A 112 (2015) 8302-7. J.J. Skinner, W. Yu, E.K. Gichana, M.C. Baxa, J.R. Hinshaw, K.F. Freed, T.R. Sosnick, "Benchmarking all-atom simulations using hydrogen exchange" Proc Natl Acad Sci U S A 111 (2014) 15975-80. A.T. Shandiz, M.C. Baxa, T.R. Sosnick, "A "Link-Psi" strategy using crosslinking indicates that the folding transition state of ubiquitin is not very malleable" Protein Sci 21 (2012) 819-27. T.Y. Yoo, A. Adhikari, Z. Xia, T. Huynh, K.F. Freed, R. Zhou, T.R. Sosnick, "The folding transition state of protein L is extensive with nonnative interactions (and not small and polarized)" J Mol Biol 420 (2012) 220-34. T.R. Sosnick, D. Barrick, "The folding of single domain proteins--have we reached a consensus?" Curr Opin Struct Biol 21 (2011) 12-24. M.C. Baxa, K.F. Freed, T.R. Sosnick, "Psi-constrained simulations of protein folding transition states: implications for calculating φ" J Mol Biol 386 (2009) 920-8. M.C. Baxa, K.F. Freed, T.R. Sosnick, "Quantifying the structural requirements of the folding transition state of protein A and other systems" J Mol Biol 381 (2008) 1362-81.